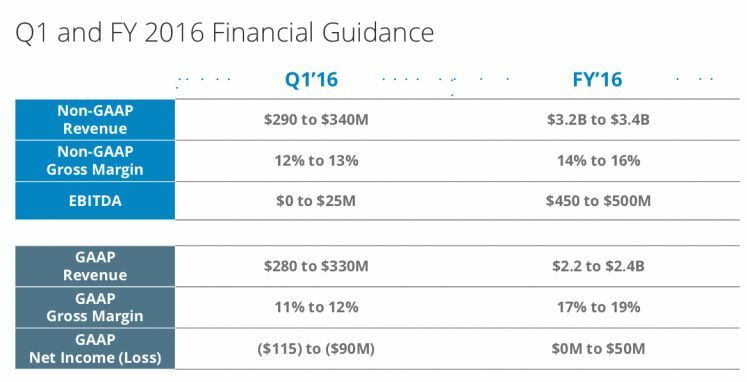 In SunPower CEO Tom Werner's words: "Bottom line -- we posted record Q4 and 2015 results." 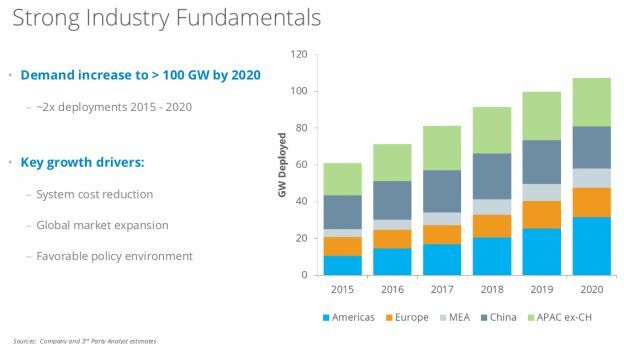 He said, "Fundamentals for solar have never been better," adding, "Our current forecast is for global solar deployment to approximately double over the coming five years with shipments exceeding 100 gigawatts by 2020." 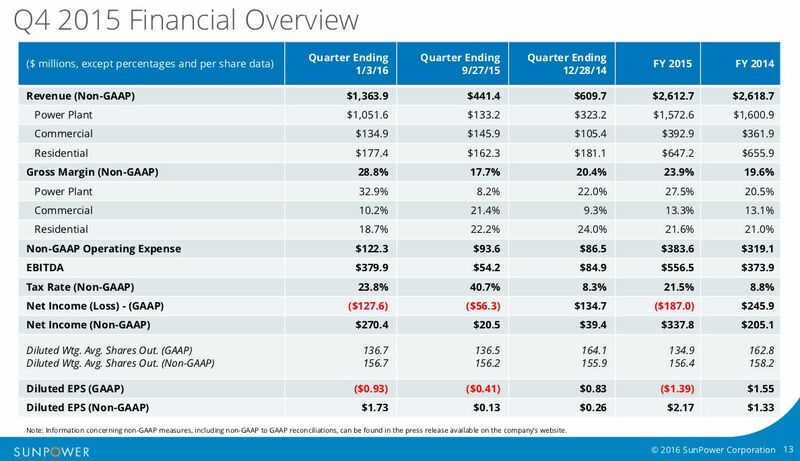 The company lost $187 million in 2015 by GAAP methods but was $337 million in the black using non-GAAP methods. Werner stressed that EBITDA is a better metric with which to gauge the company's health. 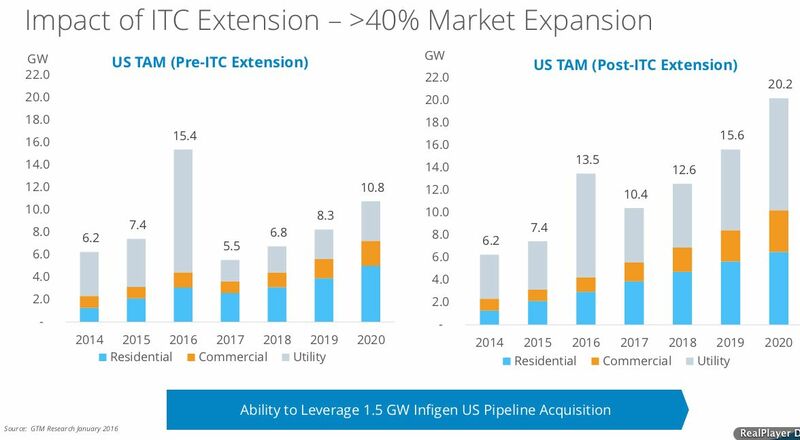 Baird writes that "management believes it is well positioned in the U.S. utility-scale market given its ~1.5-gigawatt pipeline acquired from Infigen." Werner remarked, "Here in the U.S., Congress passed a five-year extension of the Investment Tax Credit and extended bonus depreciation, which will enable further growth in tax equity financing. This legislation should provide a stable backdrop for accelerated long-term growth of the U.S. market. We were also pleased to see the California PUC approve a revised net metering proposal. This rule is very constructive with respect to further growth of the California DG market." He said, "We expect that the five-year ITC extension should drive a significant acceleration of U.S. market growth through 2020. U.S. market demand is currently expected to be almost twice as large between 2017 and 2020, as in GTM Research's previous forecast." The company's P-series product line is starting to ramp with expected volumes of 60 megawatts to 80 megawatts in 2016 and 2017 volumes in excess of 600 megawatts. The high-efficiency modules will be deployed in Asia-Pacific and Africa, while the very-high-efficiency IBC panels will be allocated to the U.S. and Japan. Of the P-series, Werner said, "We'll have a megawatt in the field in the next week." For first quarter 2016: on a GAAP basis, the company expects revenue of $280 million to $330 million, gross margin of 11 percent to 12 percent and net loss of $115 million to $90 million. For fiscal year 2016: on a GAAP basis, the company expects revenue of $2.2 billion to $2.4 billion, gross margin of 17 percent to 19 percent, and net income of break-even to $50 million. "It's time to grow again," said the CEO. 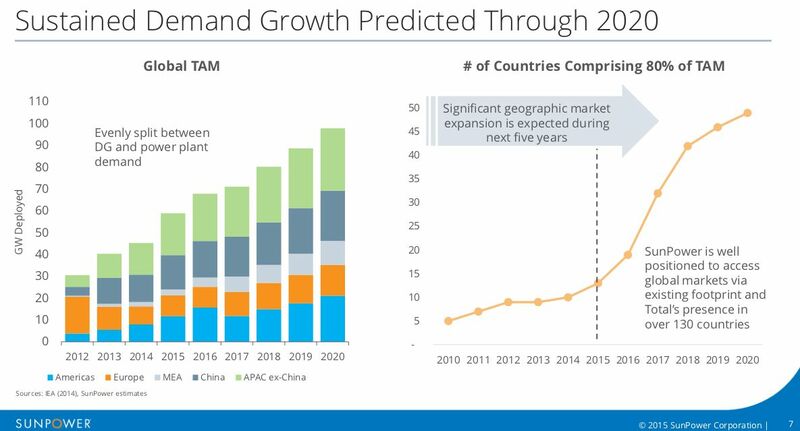 "Solar is [set to be] a $200 billion market by 2020" with 50 percent of the demand coming from Asia and China. He added, "The size of the opportunity going forward is a multitrillion[-dollar] opportunity. There aren't many markets with multitrillion[-dollar] opportunities." Werner said that the policy environment over the last 20 years has been driven by incentives and feed-in tariffs "which create supercharged markets" that "come and go." 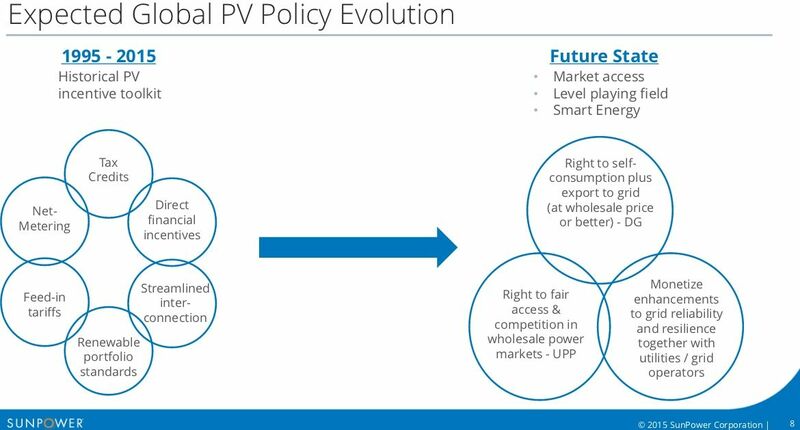 What Werner sees going forward is a market orientation that is "more about access to the grid" and is increasingly subject to "market economics." 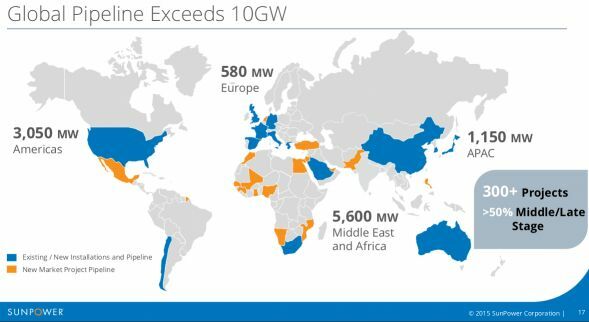 With help from its parent company, Total (the largest company in France), SunPower looks to grow in South Africa and other parts of Africa, as well as in France and Turkey. The company is ramping its panel capacity to 4 gigawatts by 2019, including more than 2 gigawatts of low-cost panels for global markets. SunPower is pushing for a 20 percent to 30 percent reduction in installed system cost by 2018. Those gigawatts of low-cost panels for global markets alluded to by Werner are going to be enabled by technology acquired from startup Cogenra. Funded by Khosla Ventures, Cogenra's original business plan targeted low-concentration PV technology. Cogenra's CEO and founder Gilad Almogy is a former senior VP at Applied Materials. Its COO, Ratson Morad, was a member of Solyndra's founding team and a former COO at Daystar. The Cogenra process involves "singulating" conventional solar cells and bonding them in a shingle-like fashion. The process gets rid of the ribbon, improves reliability and reduces non-active area. The Cogenra team has a background in process tools and is now back to designing capital equipment to scale this technology. 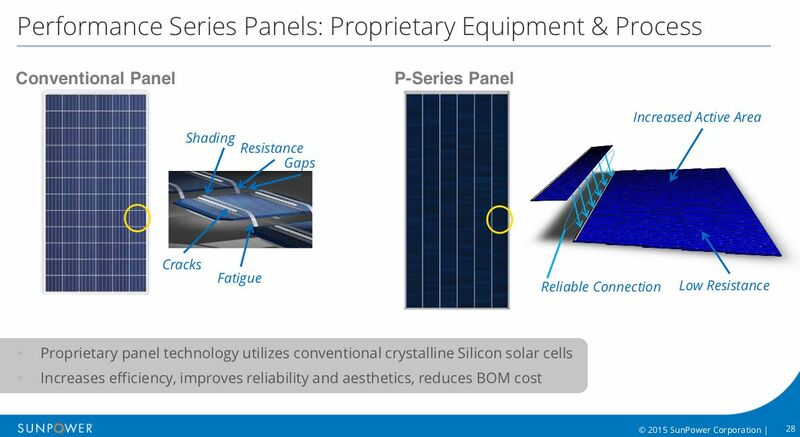 Werner said that its new lower-cost module line will produce panels with efficiencies of 17 percent to 19 percent while leveraging the "60 gigawatts of existing cell capacity." 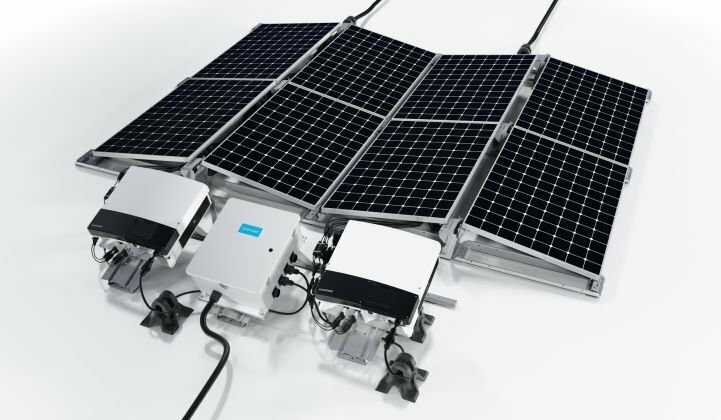 He called the Cogenra module technology "complementary" and "worthy of the SunPower brand." 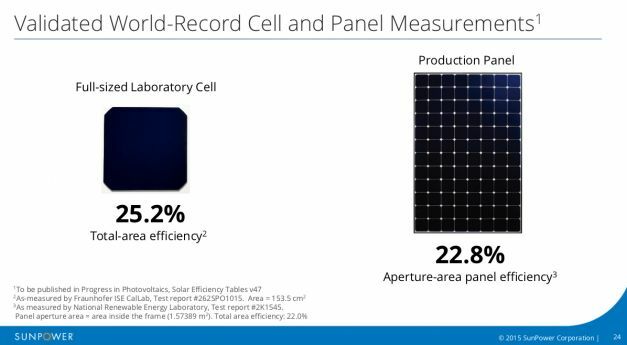 SunPower announced a new, soon-to-be-published solar cell record of 25.2 percent and an aperture-area panel efficiency of 22.8 percent, as measured by Fraunhofer ISE CalLab.